"Sexual harassment isn't just a compliance problem; it is a culture problem," Campus Provost/Executive Vice Chancellor Alison Galloway says. "How do we change this culture," Galloway asked. "This isn't about policy changes or law changes. It's about behavior changes. How do we act? We have a chance to make a difference." 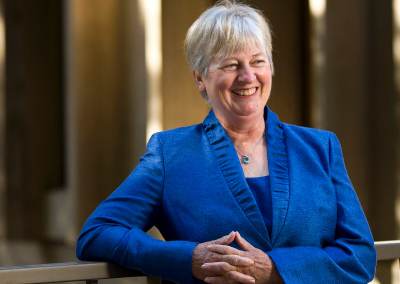 Galloway noted that many women faculty have experienced and survived sexual harassment through their careers, saying “it does not need to be that way in the future.” A major culture shift “won’t be easy,” she acknowledged, adding she is optimistic because of new UC-wide policies regarding sexual assault and sexual violence and widespread campus and public attention on the issue. "Things have changed." In emotional comments, students and faculty described their frustration with past practices that led to minor sanctions even when harassing behavior was investigated and found to have taken place. “We need to change the culture that makes it safe for this behavior to continue,” one longtime faculty member said after asking if any faculty member had ever lost their job following an investigation. Galloway announced that she has approved funding to add more investigators to the Title IX office, which investigates complaints of sexual violence and sexual assault involving campus affiliates. She also pointed out that members of the campus community can seek confidential assistance and advice at the CARE office, care.ucsc.edu, and report incidents and receive help from UC Santa Cruz police. She called on faculty and the academic senate to join her in forming a work group of faculty, staff, and students to develop changes and move the campus community beyond mere compliance to a true culture change.